By Sean Jones: Saul Canelo Alvarez’s two fights against Gennady Golovkin has given the odds-makers the belief that he’s going to easily take care of WBA World super middleweight champion Rocky Fielding when he steps up to 168 to face him on December 15 at the Staples Center in Los Angeles, California. Canelo, 28, is a 16-1 favorite to beat Fielding (27-1, 15 KOs) at Bet365, BetFair, PaddyPower and SportingBet, which means the bettors are viewing the fight as a mismatch. With odds like that, it’s hardly worth betting on the fight unless you feel the risk is worth it to bet on Fielding to win. It’s almost hopeless to pick Fielding to win, as he’s not looked good in the only three tough fights of his career against Callum Smith, John Ryder and Tyron Zeuge. Fielding won the Zeuge fight by a 5th round knockout last July in Germany, but he had the perfect situation for him to win the fight due to the German fighter having struggled to make weight. If Fielding had fought Zeuge a couple of years ago, he might have had a lot of problems beating him. Canelo was the underdog for his two fights against Golovkin. The odds-makers would have been right with their picks if a different set of judges had worked the two fights, as the fans saw two entirely different outcomes with GGG winning both contests. In the case of the Canelo-Fielding fight, the judges will likely be accurate with their predictions, as the fight is expected to end well inside the distance with Canelo knocking Fielding out. There’s obviously a chance for an upset. When you have the size, dimensions and punching power of a naturally bigger guy like the 6’1” Fielding facing a slightly worn down 5’8” Canelo, who is coming off of a grueling contest against Golovkin last September, there’s a chance for an upset. However, Canelo is likely going to go back to the safety first style of fighting that he used in his first fight with Golovkin to make sure he doesn’t absorb a lot of punishment against the heavy-handed Fielding. Canelo is still brand new for fighting at 168, because you can’t count his win over a badly weight drained Julio Cesar Chavez Jr. last year. Chavez Jr. looked like he belonged in a hospital for being so weight drained after agreeing to fight Canelo at a catchweight of 164.5 lbs. Chavez Jr. started came weighing nearly 240 pounds, and there was no chance that he was going to be able to take all the weight off without stripping off valuable muscle weight in the process, which is precisely what he did. Fielding will be Canelo’s first true test at 168, so it’s impossible to predict how he’ll do, even against a paper champion like Fielding. You can’t know for sure. Canelo is small at 5’8″, and he’s coming off of a fight against the 36-year-old Golovkin in which he was hurt in rounds 10 and 11. It doesn’t matter that Canelo survived to see the final bell and win a controversial decision. The important thing is he was hurt, and there’s unseen damage there that could cause him to be less than the fighter he was going into the two fights. When you couple that with Canelo being slower on his feet due to the weight he’s going to be packing on for the Fielding fight, he could be in for a tougher fight than many boxing fans expect. Fielding’s promoter Eddie Hearn says his fighter is going to be weighing a solid 180 lbs on the night, and ready to go to war with Canelo, who may be the same weight. There’s a difference with a gazelle-like 6’1″ fighter weighing 180 lbs and a short, stocky 5’8″ fighter weighing 180 lbs. The shorter guy is going to run out of gas after six rounds or less, and that’s going to leave it in the hands of the taller guy to take over and dominate the fight. All Fielding has to do is be competitive long enough to draw Canelo past the 6th round, and then he can take over and drown him in the second half of the fight when he gasses out like he’s been doing. Canelo wants to win his third division world title when he faces Fielding on December 15. That’s his goal. This is all about Canelo adding a third division world title while at the same time finding out if this is a division that is suited for him. With the condition that Canelo does well against Fielding, there’s a good chance that he may stay at 168. I know it’s hard for boxing fans to believe that Canelo would stay at 168, given all the great fights for him still at 160, but this would be more of a move to try and prolong his career at the top of boxing. You have to figure that Canelo’s career is quickly going to start it’s downward trajectory if he moves back down to 160 to face the lions like Jermall Charlo, Golovkin [with good judging], Daniel Jacobs, Demetrius Andrade, Billy Joe Saunders, Ryota Murata and Sergiy Derevyanchenko. If Canelo moves back down to 160 after he beats Fielding, he’s got a good chance of losing to some of those fighters starting with Charlo. In boxing all it takes is one bad knockout defeat for a fighter for his fans to jump ship and stop purchasing their fights. We’ve seen it happen with Manny Pacquiao with his PPV numbers dropping off the side of the cliff with his loss to Mayweather. In the case of Mayweather, he’s been careful in picking and choosing guys at the right time in their careers for him to beat them. Mayweather never fought Keith Thurman, Errol Spence Jr., Kell Brook, Amir Khan, Antonio Margarito [when he was still in his prime], Jermell Charlo, Jermall Charlo, Paul Williams, Golovkin, Jarrett Hurd, Erislandy Lara or Kostya Tszyu. Canelo can prolong his career if he beats Fielding and stays within the World Boxing Association’s top 15 to milk the WBA 168 lb title without facing the dangerous fighters in the division like David Benavidez, Gilberto ‘Zurdo’ Ramírez, Callum Smith and Jose Uzcategui. The only guys that Canelo would need to worry about in the WBA’s rankings at super middleweight are George Groves and Chris Eubank Jr. John Ryder might be a tough fight for Canelo as well, but mostly he would have problems against Eubank Jr. and Groves. Now that Canelo finally has a victory over Golovkin, albeit it a controversial one, he may choose to avoid the trilogy match. Like Juan Manuel Marquez with him ending his rivalry with the arguably superior Manny Pacquiao, Canelo may decide to that it’s better to move on and not take any chances of losing to Golovkin in a third fight if somehow a set of good judges that score the fight in a logical manner are assigned to the trilogy fight. Canelo will have pressure for him to fight the other champions at 168 and 160, depending on which of the two divisions he stays at. It’s likely that Canelo will pick vulnerable champions and fighters in each of the two divisions for him to fight. Guys like Jermall Charlo, David Benavidez, Groves, Jose Uzcategu and Gilberto ‘Zurdo’ Ramirez. Canelo’s controversial fights against Golovkin make it hard to take him seriously as a pound-for-pound fighter. Canelo needs to shuck the idea that he wins his close fights because of the favorable judging by the Nevada judges and instead fight outside of the state when facing quality opposition. You can’t give Canelo much credit for fighting outside of Nevada in his next fight in New York, because he’s facing the perceived weakest of the super middleweight champions. If Canelo was fighting Golovkin, Benavidez, Daniel Jacobs, Derevyanchenko, Ramirez, Smith or Uzcategui in New York, then it would mean something. Those are good fighters with the talent to beat Canelo when fighting in a venue where the judging will be quality. Canelo fighting in Las Vegas each time he faces a good fighter, it sets it up for him to be seen by boxing fans as being pampered by them in order to keep the fans coming to the city. Fielding is the secondary champion with the WBA at super middleweight. The fighter that is recognized by most boxing fans as the true champion with the WBA at super middleweight is Callum Smith (25-0, 18 KOs), who recently defeated George Groves by a 7th round knockout in the World Boxing Super Series final last month on September 28 in Jeddah, Saudi Arabia. Groves and Smith would be very tough for a short fighter like Canelo, because those guys pack a punch and know how to keep a short fighter on the outside. Groves has the kind of jab to dominate Canelo from the outside. Golden Boy Promotions’ decision to match Canelo against British fighter Fielding could be a move to setup bigger fights between Alvarez and Callum Smith, Eubank Jr. and Groves. Canelo would be showing a lot of courage in facing those guys. However, Golovkin was on the verge of fighting Eubank Jr. in 2016, but the fight failed to happen due to the British fighter not signing the contract quickly enough. Golovkin ended up facing welterweight Kell Brook in the UK in a fight that brought a lot of attention. “This is everything I’ve always dreamed of: fighting one of the best pound-for-pound stars in Madison Square Garden and my world title,” Fielding said via ESPN Deportes. “I have power in the fists, everyone knows it, to see what happens in the night when I connect it clean. (Canelo) is going up in division and he’s not going to be a big super middleweight. I know how good he is, but we will make a plan to defeat it. I know I can grab him and put him to sleep,” Fielding said. It would be easy enough for Fielding to stay on the outside and jab the shorter-armed Canelo from the outside all night long to win a decision like Mayweather did when he fought him. 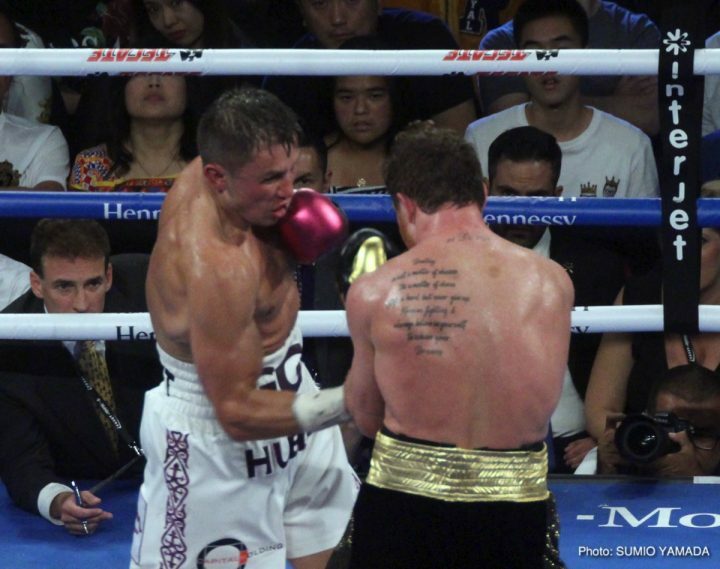 However, that didn’t work for Golovkin, who did everything Mayweather did but was given a loss against Cnaelo. If boxing is largely a popularity contest when it comes to the scoring off fights in which the more popular fight is given the decisions more often than no matter what happens, it’s not going to work for Fielding if he chooses to use his height to box Canelo from the outside like Mayweather. Fielding might actually need to knock Canelo out cold for him to win, and that’s not going to be easy to do because he rolls with the punches well to take the sting off. The best thing that seems to work to get the better of Canelo is when he’s attacked in an all out manner for a full three minutes without him getting any rest. When Golovkin fought Canelo in short bursts lasting 10 seconds, he him badly fatigued. Unfortunately for GGG, he lacked the stamina to force a fast pace for an entire round. Golovkin was often as tired as Canelo was in the two fights against him. Fielding has better stamina than Golovkin, and we saw that with the relentless way that he attacked Tyron Zeuge last July in taking over the fight in the 4th and knocking him out in the 5th. Fielding was throwing nonstop shots in the 4th and 5th rounds of that fight, and Zeuge crumbled to pieces under the relentless pace. Fielding will likely spot how Canelo gassed whenever Golovkin attacked him in an all out manner in their two fights. All Fielding needs to do is put it on Canelo nonstop on December 15, and he could ruin his trip up to super middleweight. « Canelo avoiding Jermall Charlo, could he stay at 168?